Cheap eats: Literally about a buck! Today’s value menus aren’t what they used to be. Some restaurants are even cleverly changing their names (i.e.“Dollar Menu & More”, “Right Size Right Price Menu”) to suit the rise in prices. But Del Taco is buckin’ the trend with DELicious, freshly-prepared menu items starting at 59¢ never creeping above a dollar, making the Buck & Under Menu easily the best in the industry! 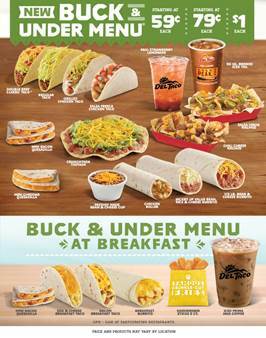 Del Taco’s Buck & Under Menu offers guests an unparalleled variety of quality choices including four different tacos, Mini Bacon Quesadilla, Crunchtada Tostada, Chili Cheese Nachos and the ½ lb. Bean and Cheese Burrito, and many other crave worthy items. At Del, folks get fresh food fast for less. Say that 3x. To boot, twice a week, Del Taco die-hards can celebrate Taco Night every Tuesday from 3 – 11 p.m. with 3 regular tacos for only $1.29 and score 3 grilled chicken tacos for $2.29 every Thursday from 3-11 p.m.